Sherry Anderson and Wade White will lead their teams into the semifinals of the 2018 World Senior Curling Championships on Saturday after battling through the qualification rounds on Friday in Östersund, Sweden. 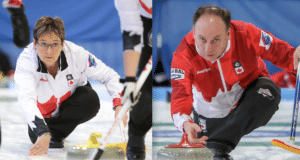 Team Canada’s men and women wrapped up the round robin with wins on Thursday morning as both teams head into playoffs at the 2018 World Senior Curling Championships in Östersund, Sweden. 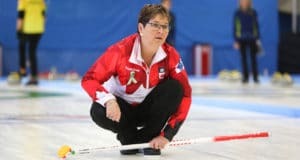 Sherry Anderson lost an 8-7 battle to Sweden’s Anette Norberg on Wednesday afternoon – the Canadian women’s first loss of the round robin at the 2018 World Senior Curling Championships in Östersund, Sweden. 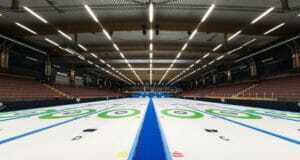 Both Canadian teams are sitting at the top of their group standings after four days of round robin competition at the 2018 World Senior Curling Championships in Östersund, Sweden. 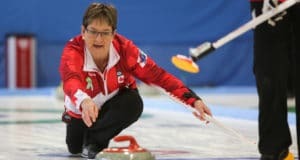 In the battle of undefeated first-place teams, it was Canada’s Sherry Anderson who came out on top of a close battle with USA’s Margie Smith on Monday morning at the 2018 World Senior Curling Championships in Östersund, Sweden. 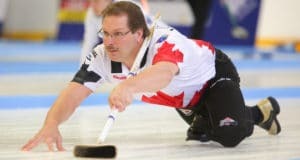 In a close contest that came down to a measure on last rock, Team Canada’s Wade White gave up a steal of one to fall 5-4 to Switzerland’s Dieter Wueest on the second day of competition at the World Senior Curling Championships in Östersund, Sweden. Canadian Senior Curling champions Sherry Anderson and Wade White got off to a strong start on Saturday at the 2018 World Senior Curling Championships in Östersund, Sweden. Canadian teams will have a chance to add to an already impressive 2017-18 world championship medal haul when the 2018 World Mixed Doubles and World Senior Men’s and Women’s Curling Championships begin Saturday in Östersund, Sweden.